In my continuous and unending search for great hamburgers in Fairfield County, I returned to SONO to sample Chef Dan Kardos’ latest version at LOCAL Kitchen and Beer Bar. Kardos is no stranger to my “Best of” list with previous version from both Harvest Supper in New Canaan and NOLA (at this same location) earning a spot. The interior of the restaurant has been transformed, with more woods and lights plus the rear room (never my favorite) was converted into a Bourbon Bar. The new décor gives a much hipper and fun feel. Chef Dan’s latest version is named “THE LOCAL BURGER” and includes all natural, humanely raised beef, sautéed wild mushrooms, bacon, Swiss cheese, fronions and black pepper mayo, encased in a Wave Hill bun…served with French fries and a pickle. I ordered it medium-rare and as I waited I looked through the menu. It includes four entrées, with the remaining items small and shared plates. Likewise it is very diverse in its cuisine’s origin, from Cuban Wraps to Pizzettes, to Pulled Pork Sliders and Thai Popcorn Chicken, the menu is a stroll around the world. The burger arrived and the first item I noticed was its size, particularly its height. The patty must include at least 8-ounces of meat (sourced from Saugatuck Craft Butchers), covered in melted Swiss cheese. 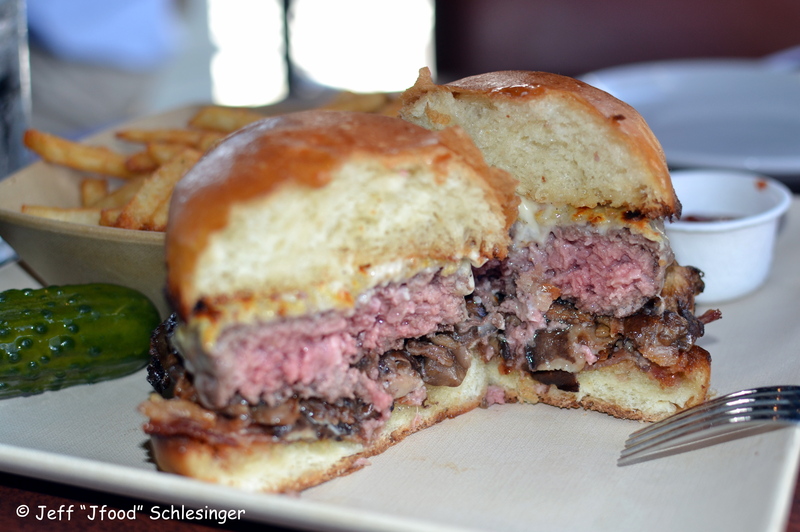 The cheeseburger sat atop the bacon, fronions and an array of sautéed wild mushroom. I cut in half and it was cooked absolutely spot on to medium-rare, the interior glistened with juice. 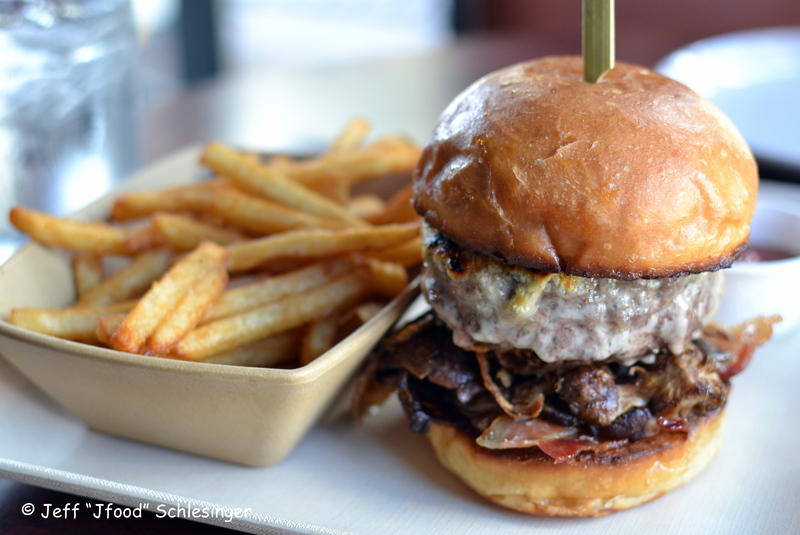 A quick bite confirmed that Saugatuck Craft has great meat and the kitchen took care in forming the patty, allowing the meat to maintain its medium grind. The oozing Swiss cheese delivered creaminess and a great nuttiness. The fronions, wild mushrooms and bacon were intermingled under the patty, with the earthiness of the mushrooms the centerpiece of the flavors. The bacon was mild with just a touch of saltiness and the onions added additional saltiness. The pepper mayo added creaminess and a little spice. The Wave Hill bun continues as my bun of choice. The fries were excellent, soft on the interior with a good crispy exterior, and seasoned perfectly. Overall I though Chef Kardos’ newest burger, “The Local Burger” is delicious, with great flavors. Whenever the owner of a restaurant that serves great food announces a second location, I am excited to see where this second venture will lead. After hearing that Greer Fredericks, the co-owner of Mama’s Boy in SONO, was opening JAX around the corner on North Main, I couldn’t wait for my first visit. 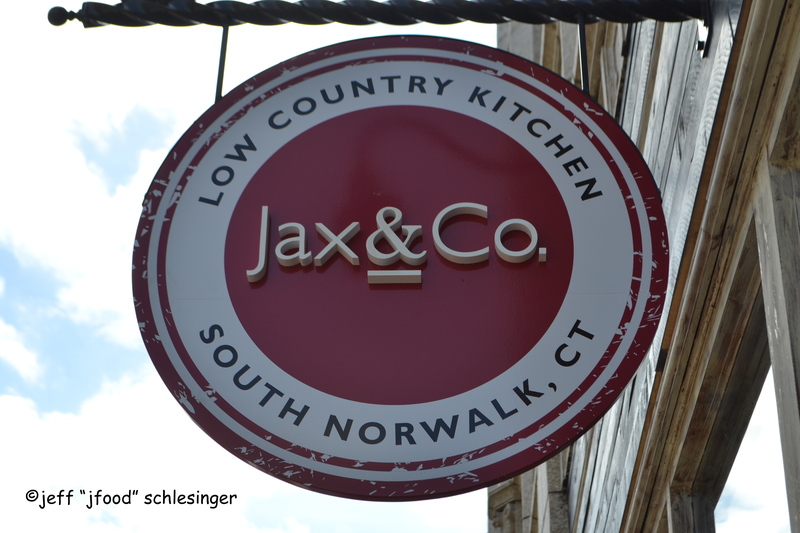 JAX opened a few weeks ago and currently serves a wide range of breakfast options, plus a tremendous selection of creative sandwiches at lunch. It is also placing the final touches to its soon to be released take-away dinners, and awaiting the delivery of its ice cream machine. Located just south of the SONO theatre, the interior is completely redesigned, accented with a red painted art nouveau ceiling and lots of wood throughout…it is definitely the sister restaurant to Mama’s Boy. There is a long communal wooden table from front to back, seats along the window, a large display case, a separate open refrigerator with a great selection of beverages and blackboards on two walls announcing the menu. When I walked into JAX, Greer was behind the counter, handling orders, making suggestions and bringing her southern charm to Norwalk. 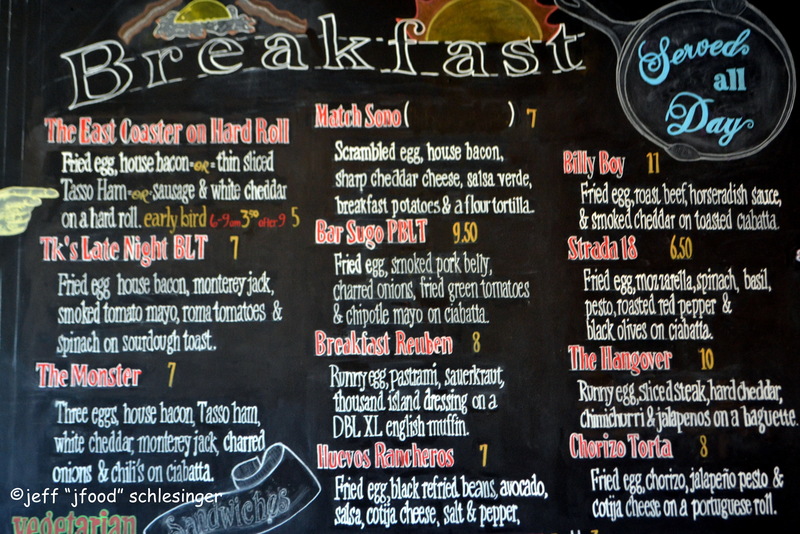 The menu is colorfully painted on the enormous multi-colored blackboard spanning the entire left wall. On my first visit I ordered the “Cubano,” described as Black Forest ham, pulled pork, Swiss, house pickles and creamy house mustard, served on a pressed Cuban roll. 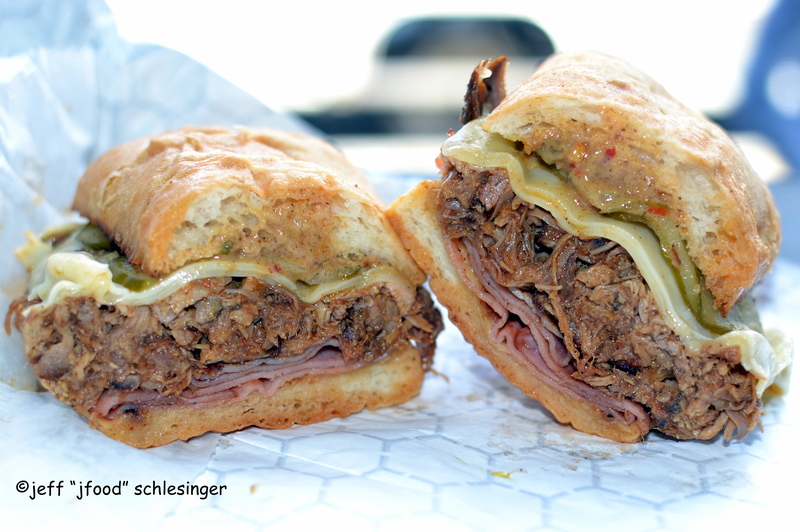 It has been a challenge over the years finding a great Cubano in the area. Jax’s rendition was delicious…my first bite was an explosion of flavors. The sandwich started with a pile of pulled pork, which was tender, juicy and full of smokiness. 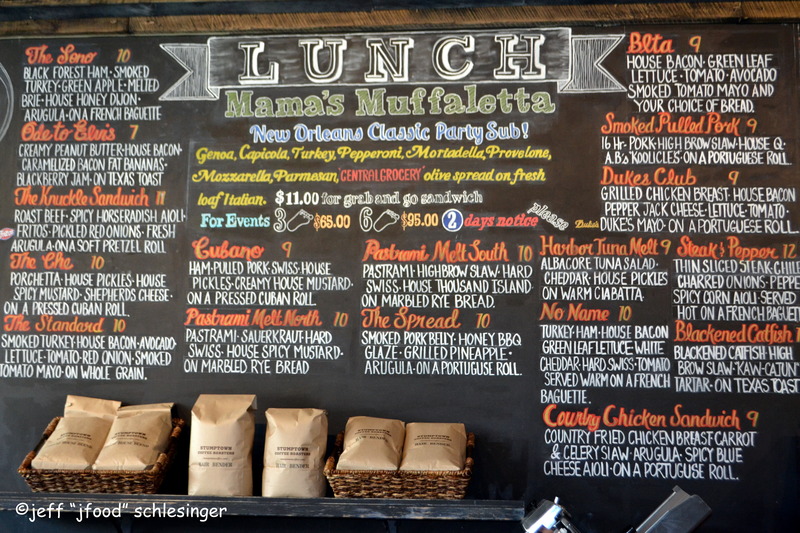 The Swiss cheese offered a touch of nuttiness, the pickles added both crunch and a little tang, the mild black forest ham contributed more smokiness and then JAX swathed the roll with a spicy house-made mustard. The combination was outstanding, and the spicy mustard really kicked up the heat. Next time I will make sure it is grilled. I cannot wait to return to JAX when it is in full swing. For now I will just have to work my way through a few more sandwiches…is “The Che,” “The Chicken and Waffle” or “The Spread” up next? It’s a tough decision. Table 104 recently opened on Long Ridge Rd just north of Saks on the way to the Merritt, the fourth re-incarnation of this space (Matteo’s, Fio’s, and Minetto’s to name a few) over the past several years. In addition to the restaurants available in the strip malls on High Ridge, Table 104 offers an option to downtown Stamford. Parking is available in an attached lot, with valet parking on the weekends. 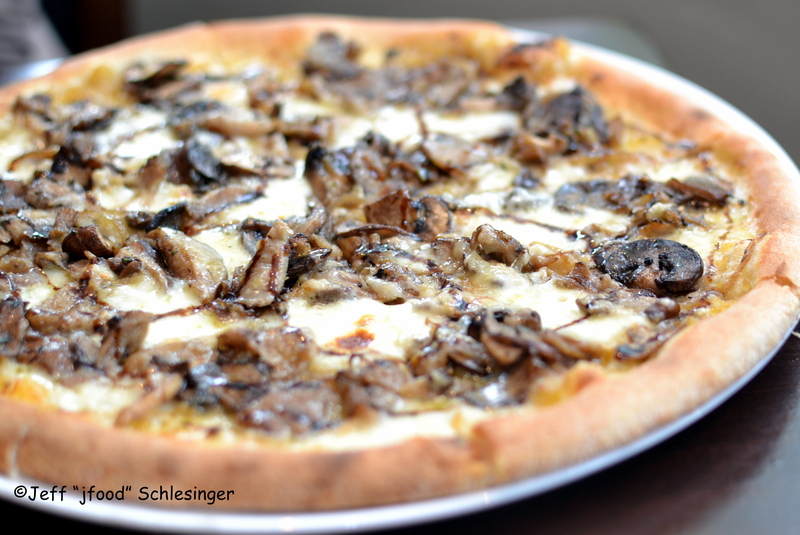 We recently visited and sampled several small plates, a two pizza combinations, a pasta and one of their larger plates. 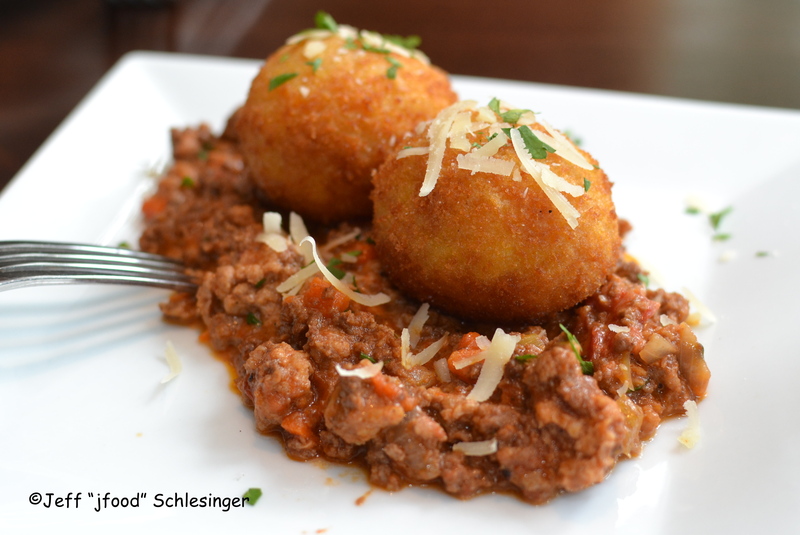 My favorite dish of the visit was the “Sicilian Arancini with the Bolognese Sauce.” The arancini were perfectly cooked to maintain its interior moistness; and the kitchen did an excellent job in frying each ball to create a crispy exterior. They sat atop a mound of Bolognese sauce, which was very good…this dish was the highlight of the visit. The other small plate, The “Meatballs, Pork-Chicken Beef, Grilled Crostino, Marinara, Shaved Grana.” was disappointing. The meatballs were severely undercooked, borderline raw, spicy and once we tasted the very rare interior we stopped eating them. The first pizza to arrive was the mushroom pizza. The mushrooms were pretty good and worked well with the cheese. The toppings on the other pizza were sausage, et. al. The sausage was also pretty good, unfortunately both suffered from a crust that was very bland. 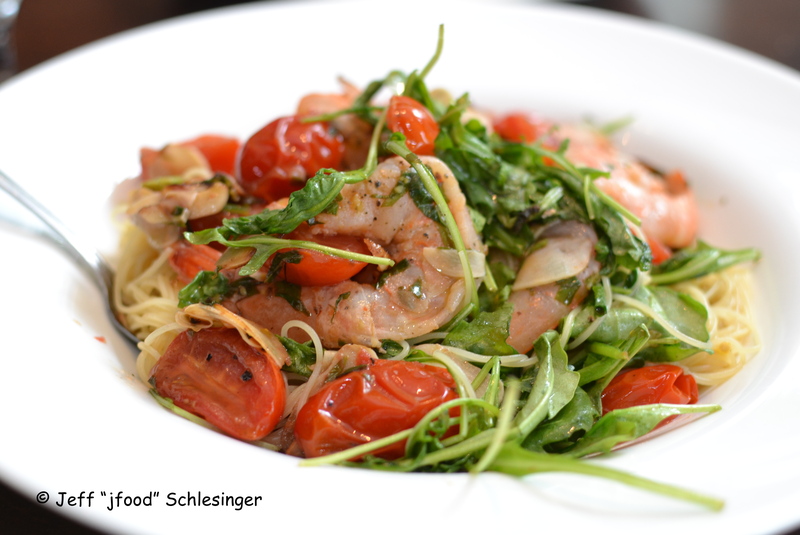 The pasta dish was capellini combined with shrimp, arugula and grape tomatoes. Other than a few slices of garlic, the dish was significantly under-seasoned, it was very bland. The “Grilled Hangar Steak, Smashed Fingerling, Roasted Peppers, Leeks, Mushroom Ragu,” ordered medium-rare, was served rare-raw. 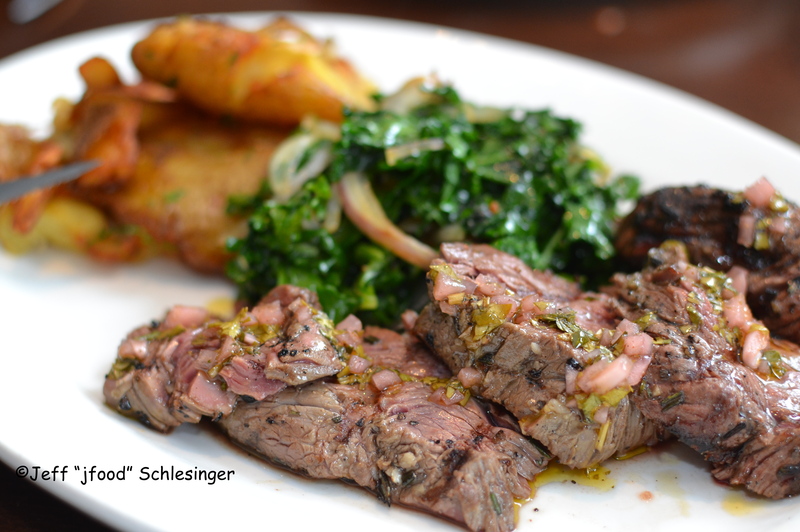 Other than a little vinegar flavor from the chimichurri, It was also under-seasoned. Unfortunately it was overwhelmed with oil from the chimichurri. The potatoes were well prepared but they too were without any seasoning. Overall it was a very disappointing visit to Table 104. Other than the arancini, the other dishes were not memorable. Matsu Sushi is located a block south of the Post Road at 33 Jessup Road. Sitting behind the glass front is a large open dining area, with a similar sized menu featuring an array of Japanese style dishes. The interior space is delightful, and takes advantage of high ceilings and an indoor waterfall. Known primarily for its creative sushi, sashimi and rolls, Matsu also offers small and large plates. A quick survey through the menu indicates the traditional sushi choices include selections from salmon to uni, plus a few cooked selections with per piece prices ranging from $2.50 to $6.00. Order by the piece, or order most of the selections as a roll. For those looking for a simple combination roll or hand roll, Matsu serves numerous options including eel, shrimp, soft shell crab, smoked salmon, salmon skin, avocado, cucumber, topped with an eel sauce, tobiko or masago. And the chefs of Matsu show their creativity with several “Fancy Rolls” that offer combinations that include King crab, lobster, soft shell crab, fried oysters, blue crab, shrimp tempura, tuna, salmon and spicy tuna. And for the adventurous, sit at the Sushi Bar and enjoy an Omakase dinner for two and let the chef guide you through a full dinner. For those looking for a larger entrée, Matsu offers Teriyaki, Negimakis, Tempuras and Katsus with numerous meats and seafood. Likewise, there are over 15 different Hibachi dinners that include soup, vegetables, a salad, plus fried rice or noodles. And lastly there are several udon or soba options to warm the guests in colder times. Matsu Sushi has been a mainstay for the sushi minded for almost ten years. Whether you are looking for a platter of sushi or sashimi, a hibachi dinner or a bowl of Udon or Soba, Matsu offers each of these in a clean and bright environment. The history of Rosy Tomorrow’s is an inspiration to all. In the early 1900s a young orphan named Rosy was taken in by a local merchants to help with household chores. The head cook of the family took a liking to Rosy and together they started catering numerous local parties. Rosy learned the power of food. At the Great Danbury Fair in 1915 she opened a booth next to the beer hall and sales of her food specialties were spectacular, and patrons returned year after year. She later organized women to compile baskets of food for returning soldiers as they disembarked at railway stations. Over 65 years later, in 1981, the Fair ended and Rosy’s booth was no more, but Rosy Tomorrow was opened. Thirty five years later, as it approaches the 100th anniversary of Rosy opening her stand at the Great Danbury Fair, Rosy Tomorrow stands as a tribute to the great woman, who started with nothing and gave everything to her love of food and her country. Today, the restaurant stands in a red planked building reminiscent of a rail car with a garden room off the back. The interior with its soaring ceilings is filled with an eclectic collection of woods, lights, high top tables, and items from all walks of life. The menu continues this eclectic focus. The appetizers include a Mucho​ Nacho Platter, Caribbean Fried Coconut Shrimp, Spicy Buffalo Style Calamari and California Mesquite Chicken Quesadilla, Rosy’s signature Fisherman’s Chowder, Chicken Pot Pie Soup, Sesame Crusted Ahi Tuna, Bangkok Beef Salad, Lobster Cobb Salad, Kantang Chicken Salad, Thai Chicken Salad, ​​​​​​​and a South of the Border Cobb Salad. There are plenty of burger combinations to choose from including a classic Bacon Cheeseburger, Swiss ‘n Portobello, Stuffed Blue Cheese and Bacon Burger, The Famous Garbage Burger (with sautéed mushrooms and onions, smoked bacon, cheese, Bermuda onion, tomato, lettuce and pickle), Maui Wowie Burger (fresh mozzarella, smoked bacon, pineapple, roasted red peppers, ranch dressing, lettuce, tomato and onion), and a Vegetable “Save the Earth” Burger. Sandwiches are equally varied and range from a French Dip with a choice of sautéed mushrooms, caramelized onions and melted cheese, a Cuban Pork Dip Sandwich, Grilled Pastrami or Chicken, a gluten free Portobello Mushroom Panini to a Spicy Buffalo Chicken Panini. For the hungrier appetite, Rosy’s Tomorrow offers a Maple Cider Chicken and Squash Kabobs, a Barolo Braised Short Ribs​​​, Atlantic Salmon, Baked Asian Atlantic Cod, Fish & Chips, and the daily Prime Rib of Beef au jus, while it lasts. After 100 years of as a mainstay in Danbury, Rosy’s Tomorrow is a tribute to that young orphaned who knew the power of food and the love of the community. The weather is turning and soon the evenings of sitting under the stars eating dinner will be both a memory and a yearning. Capriccio Café will move its menu indoors to serve traditional pizzas, pastas, and secondi selections. The menu offers a variety of antipasti from a simple Grilled Vegetable Stack and Zucchini Chips to Eggplant Parmigiana or three varieties of calamari. Almost twenty different salads are also available…a traditional Caesar and Caprese to those that include smoked or seared salmon, tuna or crab cake. There are numerous sandwiches from a provolone and ham to those that combine ham, Swiss, avocado and tomato. To complement the Italian grilled cheese selections, Capricio offers cold and hot options. The Panini section is eclectic with a basic Mozzarella, plum tomato and basil, a Cubano with roasted pork, ham Swiss cheese and pickles, a Bistecca with steak, Provolone, onions, a Gamberi e Avocado mushrooms and a shrimp, avocado, bacon, and onion plus a Porchetta with roasted pork, caramelized onions and Provolone. 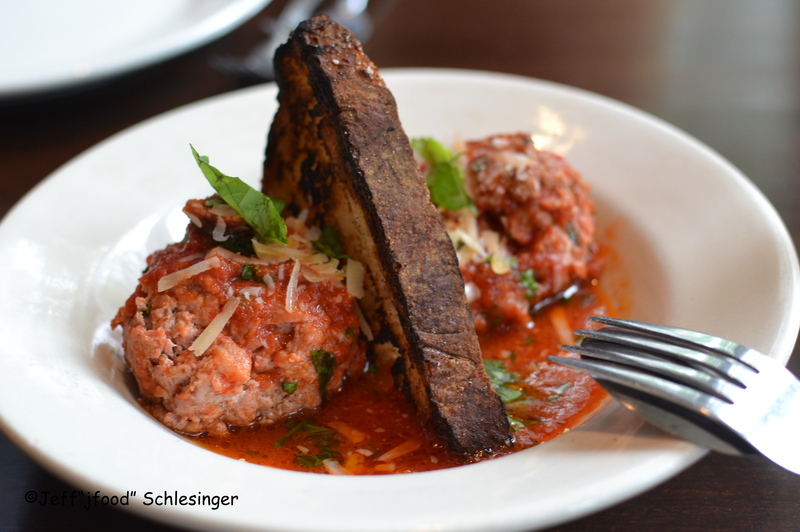 For a larger appetite choose one of over 20 pre-conceived combinations from Margherita, or add meatballs, cheery peppers, sausage, Portobello mushrooms, slices of chicken or grilled cutlets or slices of Sopressata. The toppings for the white pizza options include ricotta, speck, Prociutto, arugula, and spicy oil. Numerous pasta choices are also available. The choices incorporate a simple Spaghetti Al Pomodoro with tomato sauce and basil, a Fettuccine with veal Bolnese, Spaghetti Frutti di Mare with shrimp, clams, and calamari in a light Marinara sauce and a Penne al Pesto. Finally, the Secondi options include a Chicken Scarpariello, Tilapia al Limone, Salmon with sautéed spinach, raisins and pine nuts, and a Skirt Steak Chimichurri. Finish the meal with a selection of Gelatos from nearby Volta Gelateria. With an eclectic menu and outdoor seating, Capriccio Café offers a wide variety of cuisine for all.